The New Horizons space probe is making its journey that will take it to a flyby near the object that has now been nicknamed Ultima Thule. That event is scheduled for New Year’s Day 2019 and will allow to closely observe a so-called Kuiper Belt Object (KBO). It will be the most distant celestial body ever reached by a space probe and it’s so small and far away that it was discovered only in 2014 thanks to a search conducted with the Hubble space telescope exactly to find a target for New Horizons’ second mission. The designation 2014 MU69 is not suitable for an event like the one expected for the upcoming New Year’s Day, so NASA decided to give this celestial body at least a nickname awaiting an official decision by the IAU. The task of choosing it began last year, when a campaign to get suggestions collected 34,000 proposals with a subsequent vote. Among the most voted names, NASA decided to select Ultima Thule as a nickname. In Northern mythology, Ultima Thule is the name of the land on the northern borders of the world. To many voters and NASA judges such a nickname seemed perfect for a mission that’s traveling to a very distant and very cold frontier. The Arctic regions are really close and warm compared to that very distant object in the Kuiper Belt! An official name for Ultima Thule will be decided only some time after the flyby, when the New Horizons probe will have sent enough photos to determine its nature. The observations conducted last year revealed a strange shape that suggests that they’re actually two distinct objects, perhaps close and perhaps even in contact. 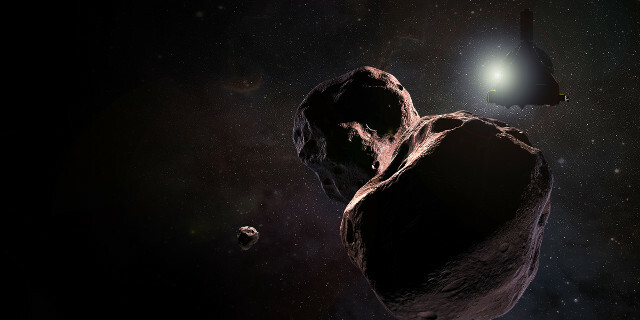 The observations made with the Hubble Space Telescope and the SOFIA flying telescope suggest even the possibility that near Ultima Thule there are smaller objects, space pebble that are the main body or bodies’ satellites. Only after having solved that mystery it will be possible to give an official name to each of the celestial bodies that form Ultima Thule.